The Salty Whale & Guesthouse has been fully refurbished and renamed by new owners. The Guesthouse is still in the works, but the restaurant features appealing wings, mussels in Thai green curry and coconut milk and a host of burgers and sandwiches. At dinner, there’s a bone-in pork chop for $26. The Jack Talk Thai mussels. Style: Beach-house chic, with distressed shiplap walls and exposed wood-beam ceiling. Nautical accents, such as ship wheels and vintage paintings of beach scenes, adorn the walls. The bar is underlit by colorful rotating lights. The Scoop: In 2018, Driftwood Hospitality bought the space previously occupied by the Manasquan Beach House and O’Neill’s Bar, Grill & Guesthouse and refurbished it. The restaurant part, the Salty Whale, opened in June. The guesthouse part is still in the works. Rooms will be available for next summer. The Menu: Landlubbers and seafarers alike will find something to love on this menu. Whale Tavern Wings ($12) come with a choice of two sauces, Caribbean Buffalo or Bourbon BBQ. 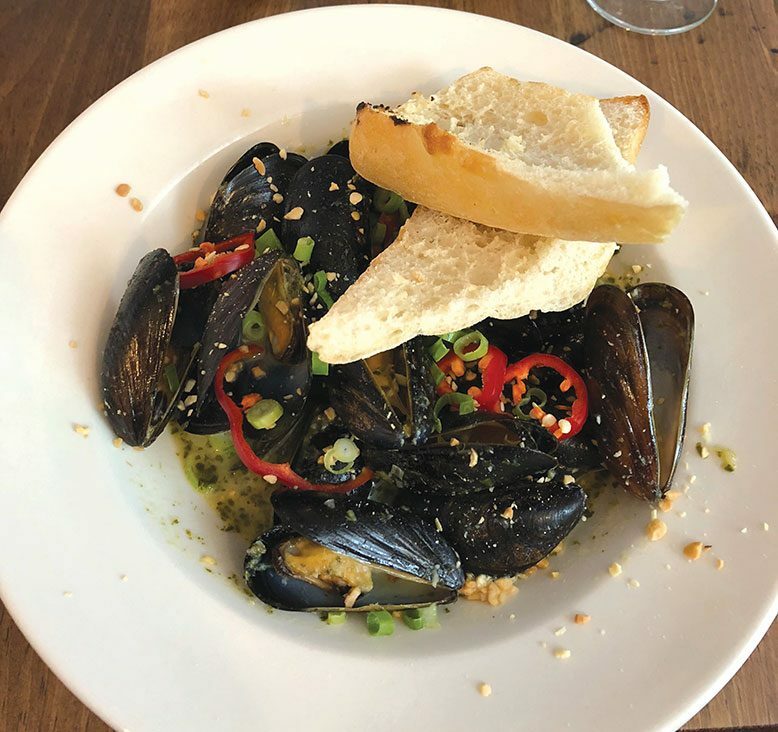 The Jack Talk Thai mussels (pictured), served with Thai green curry, coconut milk and chili cilantro, make a zesty start to your meal. Sandwich and burger choices abound. The Cali chicken sandwich ($12) combines grilled chicken, avocado, candied bacon and bourbon BBQ sauce, bringing West Coast flair to the Shore. The dinner menu includes a variety of entrées, such as a prime French bone-in pork chop ($26) and a mahi-mahi bowl with bok choy, sushi rice and red coconut-curry glaze ($25). Heads Up: Parking is available in an adjacent lot. There are no photos with those IDs or post 197652 does not have any attached images! What's a Quick Bite? Short takes on casual, affordable dining. Beach-house chic, with distressed shiplap walls and exposed wood-beam ceiling. Nautical accents, such as ship wheels and vintage paintings of beach scenes, adorn the walls. The bar is underlit by colorful rotating lights.